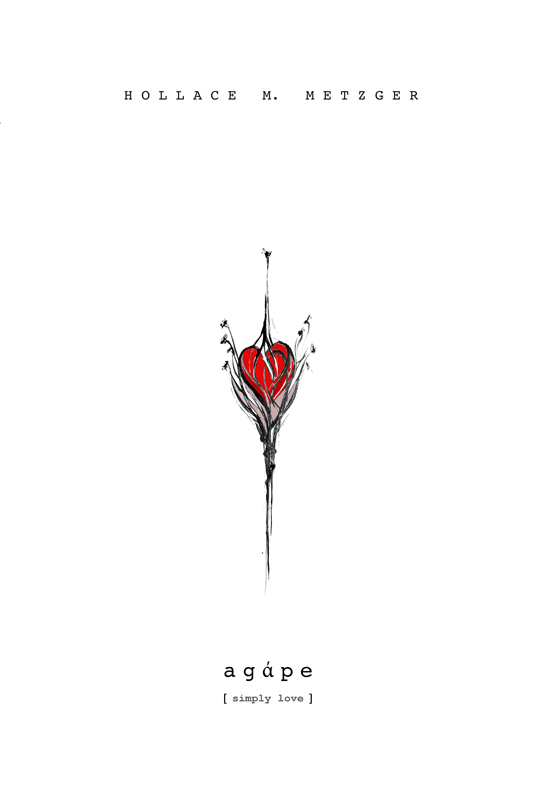 A volume of Love, for Lovers. In the spirit of St. Valentine’s Day and dedicated to the author’s mother and father on their 50th wedding anniversary, agάpe [simply love] promises to be a unique edition, fully revealing Metzger’s profound romantic side woven throughout and extracted from her six books to date. 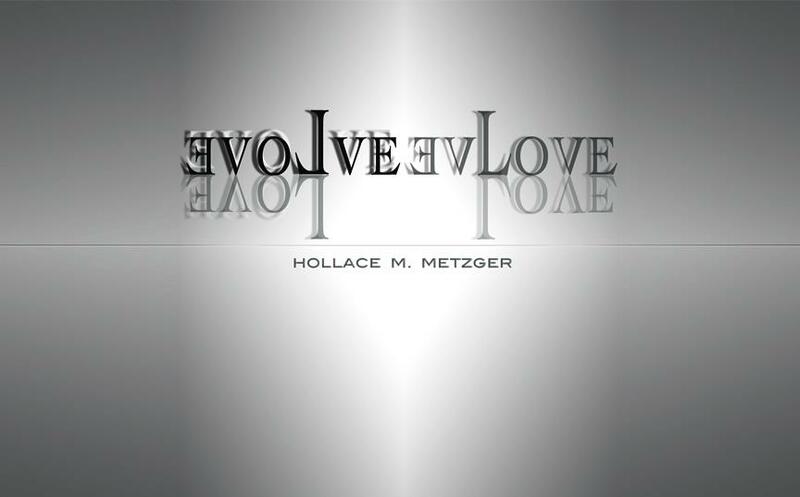 Often transcribed directly from the eyes and experience of who many have called a romantic existentialist, Metzger’s contemporary perspective is often infused with the sentiment of the troubadour, reflecting that of Chaucer’s 14th-Century shift of the religious holiday to a day for romance and courtly love. Comprised of her more positive, hopeful and courtly poems, agάpe [simply love] exhibits Metzger’s fervent belief in, and infallible hope for, the preservation of romantic love in society, spanning 15 years of traveling, observing, and living among different cultures. In the winter of 2012-13 and shortly after receiving French residency, Metzger left a life she cultivated in Europe and many dreams behind. OUT | TUO follows a five-year journey to recover those dreams, if not see them in a new light and from an altered, coming-of-age perspective. Now characteristic of the author, her Sixth Book of Poetry and Writings leans on existentialist thought to stress the idea of how, in fact, “The only way out is through”, and while living in a land much more foreign than the America and Western Europe she left behind – America, ten years later. ∃VOΓVE is a photo-poetic prospectus suggesting Man’s responsibility to shape social evolution away from the habits of the Information Age, to better communicate, to touch and be touched.∃VOΓVE displays Metzger’s ability to dig profoundly into social, political and existentialist philosophies, to question and adjust readers’ perspective by providing alternative views. 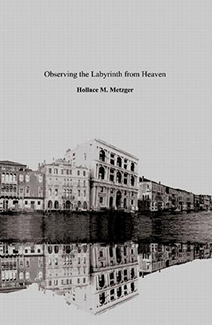 Sensitively reading human emotion while highly conscious of her environment, Metzger prolongs moments, inhales existence, then writes in deep, steady exhales which are meditative, sensual and intimate. – – ∃VOΓVE est un prospectus photo-poétique qui suggère la responsabilité de l’Homme à façonner son évolution sociale loin des sentiers de l’ère de l’information, pour mieux communiquer, toucher, et être touché. 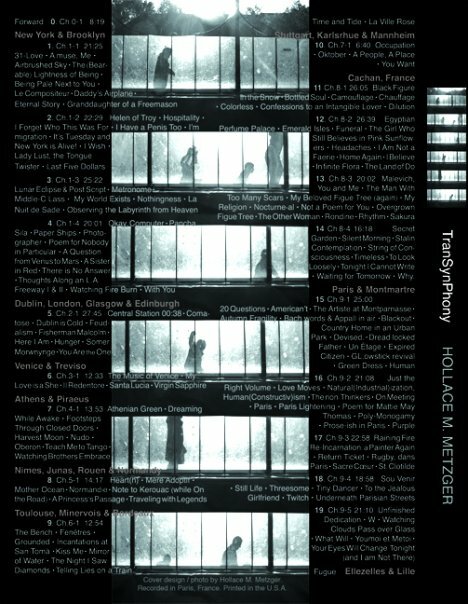 ∃VOΓVE affiche la capacité d’ Hollace Metzger à creuser profondément dans la vie sociale, philosophies politiques et existentialiste, à remettre en question et ajuster le point de vue des lecteurs, en leur apportant simplement des vues alternatives. De cette sensibilité à lire l’émotion humaine, et d’une conscience forte de son environnement, Metzger prolonge ces instants, respire l’existence, puis écrit avec passion, libère progressivement ce qu’il y a de méditatif, sensuel et intime. 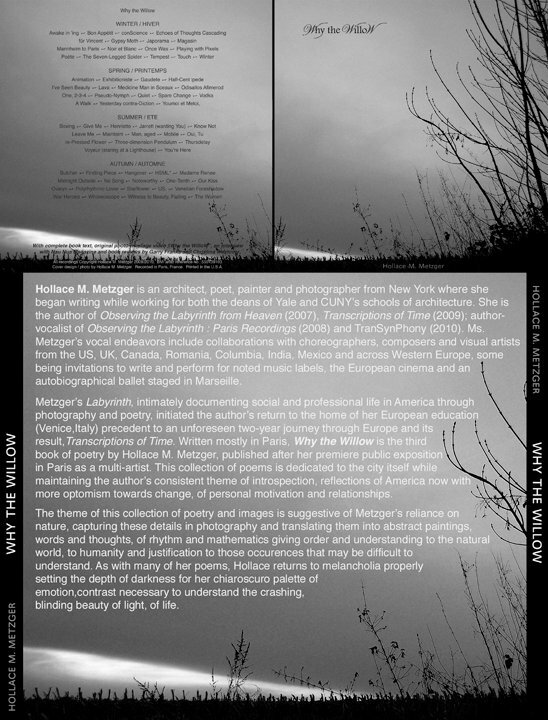 “A visionary in the truest sense, Hollace M. Metzger once again inspires us to open our hearts and minds, noticing the subtleties presented in everyday life in her latest poetry collection “Why the Willow.” While “Transcriptions of Time” was about open-ended questions, “Why the Willow” asks readers to “BELIEVE.” Believe in thinking outside of the “box.” Believe in the male and female energies surrounding us, polar opposites which blend together to create something everlasting. Believe that the colors on a “painter’s palette” are nothing less profound than the colors of the human chakras. “While reading ‘Transcriptions of Time’, one has the feeling of witnessing history in the making. Her emotionally descriptive prose proves that she is one of the greatest existentialist writers of our time. ‘Transcriptions of Time’ is a journey without a definite destination, an open-ended book, because time is infinite. Brutally honest, the richly colored prose paints living breathing pictures, and makes tangible the intangible. Written from the viewpoints of various cities, one experiences the feeling of being invisible, insignificant, yet free all at once. It is a taleof remembrance, bringing to mind the various individuals a person comes into contact with in a lifetime. It beckons one to remember the sacred ancient places in this world now hidden by factories and concrete–for they still stand, and magic is all around us. 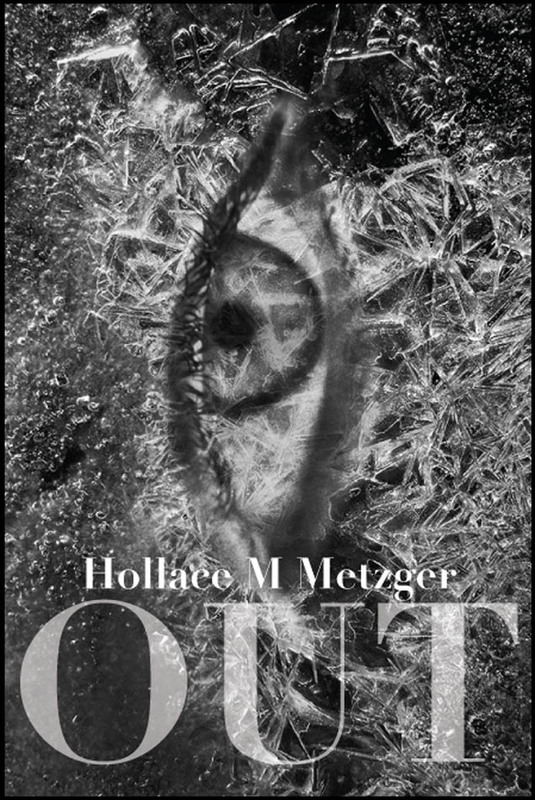 The first book of poetry by American architect, author and artist Hollace M. Metzger. Metzger was educated in the US, London and Venice, Italy before settling into the New York arts scene for the past eight years. Recently, she has been prolific in writing while performing in public salons in New York City and while traveling across Western Europe. In addition to writing, her poetic endeavors include collaborations with composers in the US, UK, Canada, across the EU and Romania. Through words, The Labyrinth’s renaissance appeal unfolds, revealing itself mysteriously but with refreshing honesty. It will take you on a journey of mind, space and time travel from the past into the future with transporting descriptions of place, of space and the bitter-sweetness of urban life paired with optimism and deep sensual undertones. Through the Labyrinth, you will find a glimpse into the library of the next generation of poets. . . . . . . . . . . . . . . . . . . . . . . . . . . . . . . . . . . . . . . . . . . . . . . . . . . . . . . . . . . . . . . . . . . . . . . . . . . . . . . . . . . . . . . . . . . . . . . . . . . . . . . . . . . . . . . . . . . . . . . . . . . . . . . . . . . . . . . . . . . . . . . . . . . . . . . . . . . . . . . . . . . . . . . . . . . . . . . . . . . . . . . . . . . . . . . . . . . . . . . . . . . . . . . . . . . . . . . . . . . . . . . . . . . . . . . . . . . . . . . . . . . . . . . . . . . . . . . . . . . . . . . . . . . . . . . . . . . . . . . . . . . . . . . . . . . . . . . . . . . . . . . . . . . . . . . . . . . . . . . . . . . . . . . . . . . . . . . . . . . . . . . . . . . . . . .
It’s Tuesday and New York is Alive!